SKU: PD-HVIHACS. Categories: As Seen In Vikings, Pendants, Wondrous Items. 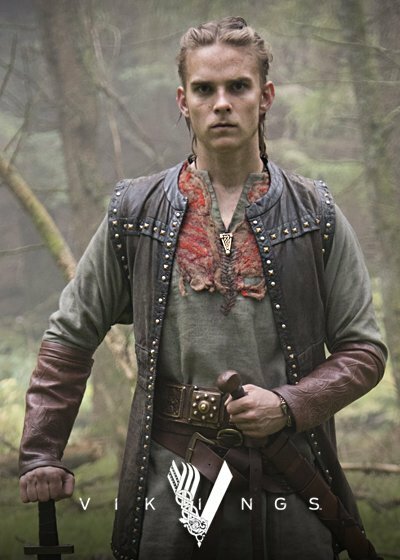 You may recognize Hvitserk’s Hacksilver Pendant from the hit television show Vikings. 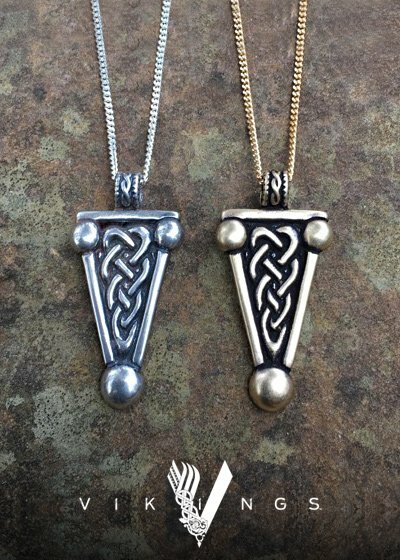 This pendant was developed especially for the character Hvitserk, but now you can wear it too! Available in bronze and sterling silver, this pendant is 2” by 1” wide (50 x 25 mm), and comes with an 18” gold or silver-tone steel chain. It was common practice among the Norse raiders to chop large items made of precious metal (usually silver). Items such as large pieces of jewelry, silverware, and religious items such as altars and book covers would be hacked in to smaller pieces. In this way the spoils of the raid could more easily be distributed among the men on the raid, and made transporting that wealth easier. These small bits of silver and gold were used as currency, and often worn as adornments as displays of personal wealth acquired in dangerous raids! They became known as hacksilver. The pendant Hvitserk wears would have been part of a larger Saxon brooch or buckle, acquired on a raid.